We have just been on a cruise with the Splendour of the Seas - 7 nights &apos;Greek Isles & Turkey Cruise&apos; from Venice November 7 to 14, 2015. Itinerary: Dubrovnik, Croatia; Rhodes, Greece; Kusadasi (Ephesus), Turkey; Split, Croatia; and back to Venice. We did &apos;Do it yourself&apos; excursions in Dubrovnik (took a shuttle from the dock to the Old Town), Rhodes (Walking distance) and Split (walking distance). organised For Ephesus we had purchased an excursion through RCI, but you can also just take a taxi from Kusadasi (30 minutes). Despite the late time of the year, we had a fantastic weather on the trip. Splendour of the Seas is a Vision-class cruise ship. She was commenced on March 31, 1996. In March 2015, Royal Caribbean agreed to sell Splendour of the Seas to TUI Cruises, which planned to lease the vessel to Thomson Cruises. The final sailing for Royal Caribbean departing on April 4, 2016 for a 16 Night Suez Canal Cruise from Dubai to Venice. She&apos;ll be renamed Thomson Discovery and be based in Palma starting in June 2016. Splendour of the Seas did meet our expectation, however some of the crew members had mentally left the ship. My review will primarily focus on the itinerary and the ports rather than the ship. Travel to Venice We always travel the day before and Friday we had a flight at 6:50pm - Lufthansa via Frankfurt to Venice. When we arrived the flight was canceled - flight attendants in Frankfurt on strike. We quickly changed our reservation for a Lufthansa flight on Saturday morning - also via Frankfurt and got a room at the Hilton Airport Hotel - as well as dinner and breakfast - at Lufthansa&apos;s expense. At 8pm it was announced that all flights in and out of Frankfurt on Saturday was canceled. Thanks to Scandinavian Airlines, we managed to get a flight via Berlin to Venice with SAS and Alitalia. Unfortunately, with rather late arrival in Venice - and therefore the risk that we may not be able to reach the cruise ship before 3:30pm which is the last time for check-in. We have just an hour to get our luggage and a taxi to the cruise ship. Originally we had planned to take a water bus (Alilaguna) from airport to Cruise terminal, but due to the late arrival we had to take a taxi. Quickly we found a taxi that drove to the 20 minutes to the cruise terminal. Day 1 - Departure from Venice We arrived at the Splendour of the Seas at 3:15pm - a &apos;quarter before closing time&apos; - but we were definitely not the last to arrive! We got an aft cabin - larger than normal cabins with a balcony much bigger - a really nice cabin. Immediately after we had boarded was the &apos;Muster drill&apos; where we had to go to our lifeboat at deck 4 and get instructions on life jackets and lifeboats. At 6pm we sailed from Venice - a spectacular sight as we passed St. Mark&apos;s Square. At 7pm we went down for a drink in the lounge and at 8pm we got dinner in the Chops Grill - one of &apos;specialty restaurants&apos; - which was a welcome aboard deals. A nice dinner. Day 2 - Dubrovnik, Croatia After breakfast, we sat on the balcony and followed the entrance to Dubrovnik. We docked at noon. After lunch we took a shuttle bus the four km from the cruise terminal to the old town. We bought the transfer at the ship for € 12 pp - cheaper than a taxi. Dubrovnik, known for the old town there is a pedestrian area with straight streets. The town has several churches, monasteries, and the Old Town Hall, from the period year 1200-1600. The city is surrounded by a very well-preserved city wall, which is 2 km long, 25 m high and most places 6 m thick. There are four gates into the city - we went through &apos;Pile Gate&apos; (top picture). In the wall there are many towers and two high corner fortresses. We started with a walk around the city walls, a lot of stairs up and down, and incredible views of the city churches and houses and the sea from the high wall. We went all around the city on the wall. After the wall went for a walk around town and looked at the churches and streets - an incredibly clean city. Late afternoon we took the shuttle back to the ship. After a drink at the bar, we got dinner in the restaurant ´King & I&apos;. Day 3 - At Sea We sailed south, along the coast of Greece - towards Rhodes. Today we were at sea all day in beautiful weather - 22 C and calm sea. The clock was put forward by one hour in the night, and it was obvious that everyone was a bit later for breakfast. We chose to eat breakfast on the balcony. This morning we read the daily newspaper on our iPad&apos;s - network is not as fast as on the Quantum Class of ship but after some time we managed to download the newspaper. After lunch we set out again on the balcony - the sun was shining and the weather was lovely. It was &apos;formal night&apos; - first captain&apos;s welcome in the center and then dinner in the restaurant. After dinner we walked round the ship, to the shops in Centrum, listened to music and had a glass of wine in the bar before bedtime Day 4 - Rhodes We followed the arrival to Rhodes from the upper deck, and 11am went we ashore in Rhodes town (walking distance). At the port are a number of beautiful old windmills and behind them a 4 km of preserved town walls that encircle the old town. The town lies on the island&apos;s northern tip and is surrounded by sea on three sides. The old town is just 5 minutes walk from the port. The city is like a large fortress, and is untouched the last 400 years. We walked through the old narrow streets and looked at the city&apos;s sights. The highlight is the Palace of Grand Master of Knights, which was built in the 1300s and is today the city&apos;s landmarks. From the Palace Grand Master leads the The Street of the Knights, down to the archaeological museum. The street is considered one of the best preserved medieval streets in Europe. The Turkish part of the town is also interesting, including Soliman mosque that was built when the Turks conquered Rhodes in 1522. Back on the ship we ate lunch and read on the balcony overlooking the city of Rhodes. We ate dinner already at 6pm when there was "welcome back" reception. A glass of champagne and the latest news on Royal Caribbean Cruising. Then there was show in the Centrum - &apos;The East Coast Boys&apos;. We ended the evening with a glass of wine in Scooner Bar. Day 5 - Trip to Ephesus Arrived to Kusadasi in Turkey in the morning. We were on tour (through the ship) in the morning to Ephesus on Turkey&apos;s west coast 30 minutes from the harbour of Kusadasi, located almost off the Greek island of Samos. In ancient times, Ephesus was a rich city of great religious and commercial importance. The town was built in the valley between two mountains. It was located on the important silk route between Rome and the Orient. In ancient Ephesus was a city that was at the river Kaystros&apos; estuary, but today is a town about 10 km from the coast. According to ancient legends, the city was founded in 1100 BC by King Androklos from Athens. In the 500s, the port of Ephesus destroyed by mud from the river, and the city&apos;s economic importance decreased rapidly. The inhabitants fled due to malaria and since the city was buried in mud. Today, about 20% of the original Ephesus excavated (pictures) - streets paved with marble and ruins of the merchants&apos; houses, temples and theaters. Back in Kusadasi we visited a factory that makes carpets of wool, cotton and silk - interesting to see how silk threads are extracted from the butterfly pupae how the rugs are hand-knotted and hear about and see the different qualities. After lunch we enjoyed the sun and a cup of coffee on the balcony. At 5pm we followed the exit from Kusadasi from our balcony and 6pm there was dinner in the &apos;King & I&apos; dining room. After dinner we had a drink in the lounge and at 9pm we saw a Production Show with &apos;Royal Caribbean Singers and Dancers&apos; - Dancin&apos; Thru the Movies - as usual a great show with good music, dancing and singing. Day 6 - At Sea It was a really nice day of sun on the balcony in the morning - the deck chairs are put into position! After breakfast we enjoyed the sun - late morning we had arranged a meeting with &apos;Next Cruise&apos; to get a deal on a cruise to New England next year. After lunch, even a little sun and coffee on the balcony. We got dinner at 6pm in Chops Grille and immediately thereafter, there was a welcome back reception for the guests who had traveled most of Royal Caribbean - this was our cruise no. 25, but there were many cruisers with multiple cruises. We walked around the ship and completed the evening with an aerial show in the Centrum. Day 7 - Split in Croatia Now we felt that we had come a little further north. The wind was cooler. The captain had put the ship in the harbor so we had morning sun on our balcony. After breakfast we prioritized the sun on our balcony instead of Split. After lunch we went to the old town - 10 minutes walk from the cruise port. Split was originally built as a castle in the year 300 but it was 400 years later transformed into a city. An elegant promenade with palm trees (picture). We walked around town looking at the sights. An old town with very narrow streets, palaces and church walled. Back on the ship, we got a coffee and then we went around a bit. A glass of wine before dinner. After dinner, we decided on a manhattan cocktail in the lounge before the suitcases were packed. The suitcases were outside the door before 11pm, so they could be amassed during the night. Saturday - from the cruise ship to the airport We were up at 7:30am and ready for breakfast at 8:30. There was the usual "return chaos" in the Windjammer Cafe. We found a good seat on the pool deck. However, a little cool. The weather is not as good as at the departure from Venice. As there was plenty of time for our flight departure from Venice Marco Polo airport, we had decided to take the 1 h 40 min Alilaguna water bus from the cruise terminal to the Venice Marco Polo airport. We did miss that opportunities at cruise start due to very late arrival. We had an excellent boat from the cruise terminal to the airport. When we arrived at the airport we could see the great advantage of being SAS gold card customer. There was a long line at check in, but we could put us in the very short business class queue. Also we had &apos;fast track&apos; access through the security check and got lunch in the Lufthansa lounge. We have just been on a cruise with the Splendour of the Seas - 7 nights &apos;Greek Isles & Turkey Cruise&apos; from Venice November 7 to 14, 2015. We did &apos;Do it yourself&apos; excursions in Dubrovnik (took a shuttle from the dock to the Old Town), Rhodes (Walking distance) and Split (walking distance). organised For Ephesus we had purchased an excursion through RCI, but you can also just take a taxi from Kusadasi (30 minutes). In March 2015, Royal Caribbean agreed to sell Splendour of the Seas to TUI Cruises, which planned to lease the vessel to Thomson Cruises. The final sailing for Royal Caribbean departing on April 4, 2016 for a 16 Night Suez Canal Cruise from Dubai to Venice. She&apos;ll be renamed Thomson Discovery and be based in Palma starting in June 2016. Splendour of the Seas did meet our expectation, however some of the crew members had mentally left the ship. My review will primarily focus on the itinerary and the ports rather than the ship. We always travel the day before and Friday we had a flight at 6:50pm - Lufthansa via Frankfurt to Venice. When we arrived the flight was canceled - flight attendants in Frankfurt on strike. We quickly changed our reservation for a Lufthansa flight on Saturday morning - also via Frankfurt and got a room at the Hilton Airport Hotel - as well as dinner and breakfast - at Lufthansa&apos;s expense. At 8pm it was announced that all flights in and out of Frankfurt on Saturday was canceled. Thanks to Scandinavian Airlines, we managed to get a flight via Berlin to Venice with SAS and Alitalia. Unfortunately, with rather late arrival in Venice - and therefore the risk that we may not be able to reach the cruise ship before 3:30pm which is the last time for check-in. We have just an hour to get our luggage and a taxi to the cruise ship. Originally we had planned to take a water bus (Alilaguna) from airport to Cruise terminal, but due to the late arrival we had to take a taxi. Quickly we found a taxi that drove to the 20 minutes to the cruise terminal. We arrived at the Splendour of the Seas at 3:15pm - a &apos;quarter before closing time&apos; - but we were definitely not the last to arrive! 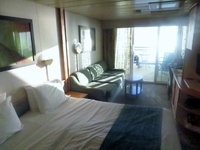 We got an aft cabin - larger than normal cabins with a balcony much bigger - a really nice cabin. Immediately after we had boarded was the &apos;Muster drill&apos; where we had to go to our lifeboat at deck 4 and get instructions on life jackets and lifeboats. At 6pm we sailed from Venice - a spectacular sight as we passed St. Mark&apos;s Square. At 7pm we went down for a drink in the lounge and at 8pm we got dinner in the Chops Grill - one of &apos;specialty restaurants&apos; - which was a welcome aboard deals. A nice dinner. After breakfast, we sat on the balcony and followed the entrance to Dubrovnik. We docked at noon. After lunch we took a shuttle bus the four km from the cruise terminal to the old town. We bought the transfer at the ship for € 12 pp - cheaper than a taxi. Dubrovnik, known for the old town there is a pedestrian area with straight streets. The town has several churches, monasteries, and the Old Town Hall, from the period year 1200-1600. The city is surrounded by a very well-preserved city wall, which is 2 km long, 25 m high and most places 6 m thick. There are four gates into the city - we went through &apos;Pile Gate&apos; (top picture). In the wall there are many towers and two high corner fortresses. We started with a walk around the city walls, a lot of stairs up and down, and incredible views of the city churches and houses and the sea from the high wall. We went all around the city on the wall. After the wall went for a walk around town and looked at the churches and streets - an incredibly clean city. Late afternoon we took the shuttle back to the ship. After a drink at the bar, we got dinner in the restaurant ´King & I&apos;. We sailed south, along the coast of Greece - towards Rhodes. Today we were at sea all day in beautiful weather - 22 C and calm sea. The clock was put forward by one hour in the night, and it was obvious that everyone was a bit later for breakfast. We chose to eat breakfast on the balcony. This morning we read the daily newspaper on our iPad&apos;s - network is not as fast as on the Quantum Class of ship but after some time we managed to download the newspaper. We followed the arrival to Rhodes from the upper deck, and 11am went we ashore in Rhodes town (walking distance). At the port are a number of beautiful old windmills and behind them a 4 km of preserved town walls that encircle the old town. The town lies on the island&apos;s northern tip and is surrounded by sea on three sides. The old town is just 5 minutes walk from the port. The city is like a large fortress, and is untouched the last 400 years. We walked through the old narrow streets and looked at the city&apos;s sights. The highlight is the Palace of Grand Master of Knights, which was built in the 1300s and is today the city&apos;s landmarks. From the Palace Grand Master leads the The Street of the Knights, down to the archaeological museum. The street is considered one of the best preserved medieval streets in Europe. The Turkish part of the town is also interesting, including Soliman mosque that was built when the Turks conquered Rhodes in 1522. Back on the ship we ate lunch and read on the balcony overlooking the city of Rhodes. We ate dinner already at 6pm when there was "welcome back" reception. A glass of champagne and the latest news on Royal Caribbean Cruising. Then there was show in the Centrum - &apos;The East Coast Boys&apos;. We ended the evening with a glass of wine in Scooner Bar. We were on tour (through the ship) in the morning to Ephesus on Turkey&apos;s west coast 30 minutes from the harbour of Kusadasi, located almost off the Greek island of Samos. In ancient times, Ephesus was a rich city of great religious and commercial importance. The town was built in the valley between two mountains. It was located on the important silk route between Rome and the Orient. In ancient Ephesus was a city that was at the river Kaystros&apos; estuary, but today is a town about 10 km from the coast. According to ancient legends, the city was founded in 1100 BC by King Androklos from Athens. In the 500s, the port of Ephesus destroyed by mud from the river, and the city&apos;s economic importance decreased rapidly. The inhabitants fled due to malaria and since the city was buried in mud. Today, about 20% of the original Ephesus excavated (pictures) - streets paved with marble and ruins of the merchants&apos; houses, temples and theaters. At 5pm we followed the exit from Kusadasi from our balcony and 6pm there was dinner in the &apos;King & I&apos; dining room. After dinner we had a drink in the lounge and at 9pm we saw a Production Show with &apos;Royal Caribbean Singers and Dancers&apos; - Dancin&apos; Thru the Movies - as usual a great show with good music, dancing and singing. It was a really nice day of sun on the balcony in the morning - the deck chairs are put into position! After breakfast we enjoyed the sun - late morning we had arranged a meeting with &apos;Next Cruise&apos; to get a deal on a cruise to New England next year. After lunch, even a little sun and coffee on the balcony. We got dinner at 6pm in Chops Grille and immediately thereafter, there was a welcome back reception for the guests who had traveled most of Royal Caribbean - this was our cruise no. 25, but there were many cruisers with multiple cruises. We walked around the ship and completed the evening with an aerial show in the Centrum. Now we felt that we had come a little further north. The wind was cooler. The captain had put the ship in the harbor so we had morning sun on our balcony. After breakfast we prioritized the sun on our balcony instead of Split. After lunch we went to the old town - 10 minutes walk from the cruise port. Split was originally built as a castle in the year 300 but it was 400 years later transformed into a city. An elegant promenade with palm trees (picture). We walked around town looking at the sights. An old town with very narrow streets, palaces and church walled. Back on the ship, we got a coffee and then we went around a bit. A glass of wine before dinner. After dinner, we decided on a manhattan cocktail in the lounge before the suitcases were packed. The suitcases were outside the door before 11pm, so they could be amassed during the night. We were up at 7:30am and ready for breakfast at 8:30. There was the usual "return chaos" in the Windjammer Cafe. We found a good seat on the pool deck. However, a little cool. The weather is not as good as at the departure from Venice. As there was plenty of time for our flight departure from Venice Marco Polo airport, we had decided to take the 1 h 40 min Alilaguna water bus from the cruise terminal to the Venice Marco Polo airport. We did miss that opportunities at cruise start due to very late arrival. We had an excellent boat from the cruise terminal to the airport. When we arrived at the airport we could see the great advantage of being SAS gold card customer. There was a long line at check in, but we could put us in the very short business class queue. Also we had &apos;fast track&apos; access through the security check and got lunch in the Lufthansa lounge.